This pre-owned caravan has a lot going for it! It is situated on a recently developed sheltered area of the Park with it’s own parking space and is south facing with a large timber balcony. 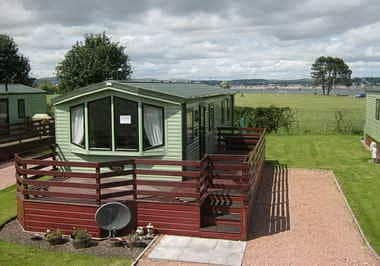 It is on the edge of the Caravan Park with a gorgeous view out the back over parkland towards the Tay and the hills behind Dundee. 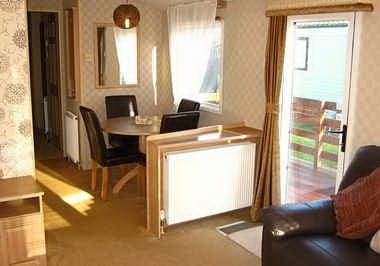 At a generous 37 x 12 the previous owners removed the built in furniture in the living and dining areas and actually improved the look and feel of the caravan with 2 new sofas in the lounge area and a matching free standing dining set. 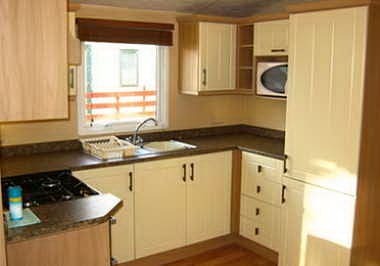 A spacious kitchen features a full size built in fridge freezer. The master bedroom is ensuite and is one of the largest and well-designed master bedrooms we’ve seen. 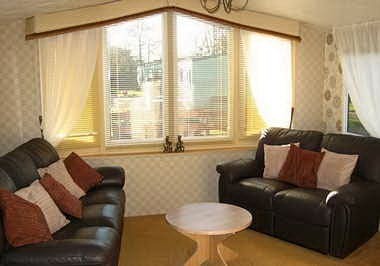 The caravan is in great condition and is double glazed and centrally heated.